The EIB’s ReM framework enables a thorough assessment of results, not only as expected at project appraisal but also at project completion. This is now possible for an increasing number of projects. In 2017, 26 such projects reached completion, including 18 credit lines for SMEs and mid-caps and eight infrastructure projects. The 18 ReM framework-appraised credit lines completed in 2017 include six in the pre-accession region (five in Turkey and one in Serbia); the remaining ones supported lending to SMEs in Botswana, Ghana, Kenya, Mozambique, Nigeria and Tanzania. 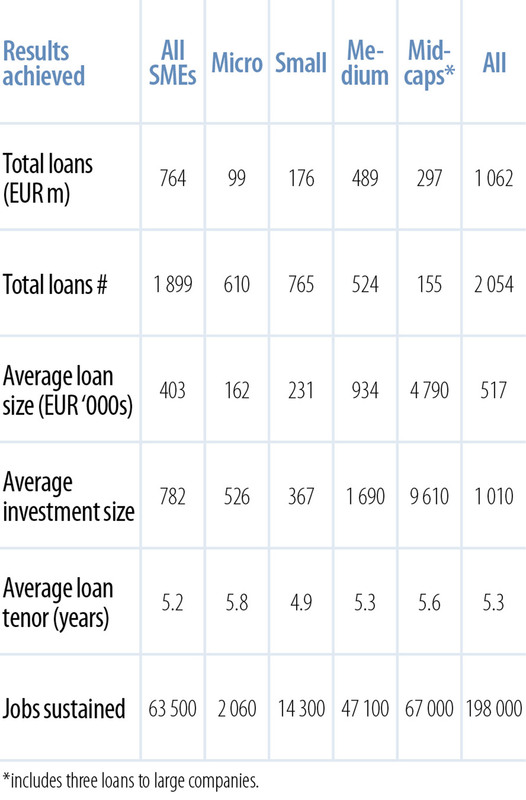 They lent a total of EUR 1.06bn through 2 054 loans with an average duration of 5.3 years, exceeding the conditions typically available in local markets. Of these, 1 899 went to SMEs and 155 to mid-caps. This lending is helping to sustain 198 000 jobs in the final beneficiary companies. One notable feature of the credit lines in the pre-accession region is that “micro” companies (fewer than 10 employees) tend to invest in larger projects rather than small companies (10-49 employees) and benefit from longer tenor periods. An examination of the data on individual loans suggests that this is because many micro firms are start-ups or individual entrepreneurs planning relatively large investments. Many of these investments involving the construction of assets such as business premises are likely to benefit from longer tenor because the assets are more likely to be accepted as collateral. Many are also linked to significant expected job creation, although it is difficult to produce reliable aggregate figures for job creation expected by loan recipients. For example, one “micro” loan for the establishment of a private hospital centre is expected to employ 400 people when it is completed. These aggregate results broadly meet expectations at appraisal, although with some specific differences that are being used to refine the ex ante estimation of results in the future. In the pre-accession region, more companies benefited than expected, and loans were on average slightly smaller. In the ACP region, however, loans tended to be larger than expected, supporting more capital-intensive investment projects, with total jobs sustained lower than estimated. The average loan tenor period was broadly in line with expectations across both regions. Among the social and economic infrastructure projects that have been tracked using the Results Measurement framework since 2012, eight reached completion in 2017. These included three large allocations (sub-projects) under framework loans, the results of which can now be assessed. They include four projects in the energy sector, two in agriculture and forestry, one in the health sector and one in telecommunications. The four energy sector projects all focused on electricity generation from renewables, and included the Tafila Wind Farm project in Jordan, and three framework loan allocations in Costa Rica, Chile and India. Together these operations produced, at completion, enough electricity to serve 452 000 households. This matched expectations except in the case of a hydropower project in Costa Rica where power output in the first year after completion was lower (100 GWh instead of 225 GWh expected) because of unfavourable hydrological conditions in that year due to the El Niño phenomenon. Agriculture and forestry were represented by the MHP Agri-food project in Ukraine and the Afforestation and Erosion Control 2 project in Turkey. The former has installed storage capacity for 340 000 tonnes of grain and is enabling 720 000 tonnes of animal feed to be processed annually, improving the resilience and value added of the agri-food sector in the country. In Turkey, 124 000 hectares of forest were planted, exceeding expectations of 80 000 hectares, although the area of forest and rangeland rehabilitated was somewhat lower. In the telecommunications sector, the Broadband Roll-out Eastern Regions project, also in Turkey, has connected just over one million homes to broadband, with broadband services accessible for a total of 2.8 million homes. This is actually substantially more than was expected, with many more households taking up broadband connections. In the health sector, a new hospital was successfully built to serve 195 000 people in Nouméa, the capital city of New Caledonia, and in the southern region of the country. It treated 42 100 patients in the first year of operation, close to expectations. The number of permanent jobs created by the projects was slightly lower than expected, at nearly 5 000, but the volume of employment supported during construction, at 55 400 person-years, was notably higher than was estimated at appraisal. This is due to the two projects in Turkey, which were both labour-intensive in nature and ended up generating more temporary employment than originally foreseen.